Our first day (Sunday July 29) at the 2012 National Championships was a travel day. 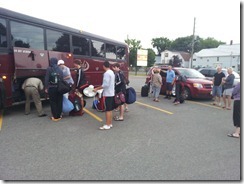 The day began at 5:15 am when the bus left Quispamsis with Saint John area players and coaches. After stops in Fredericton, Woodstock and Grand Falls we hit the road for Bishops University in Sherbrooke, Quebec. Three movies later and a quick stop for lunch we pulled in Bishops University at 3:30 pm Eastern. This was my first time visiting Bishops and so far it’s been an excellent first impression. I was expecting a large campus in the “downtown” core but Bishops is the exact opposite. The campus reminds me more of St. Thomas or Mount Allison and has a small town feel our NB athletes would be very familiar with. The people that greeted us on arrival have been fantastic hosts as well. From Bishops’ varsity men’s head coach Rod Gilpin, to Cindy (the lady with all the answers) at food hall, everyone has been very friendly and more than willing to help us with our requests. Monday is an off day but a busy one. We practice at 10:00 am followed by a testing combine, team photo session and a tournament meeting for players and coaches. Our focus for the day is to settle into our daily routine and adjust to our new environment. As we’ve told the players…let’s be the best at controlling the controllables.